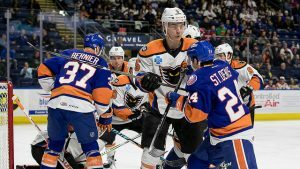 Bridgeport, CT – John Muse stopped everything thrown his way through a wild frenzy of shots in the third period thwarting a desperate comeback effort from Bridgeport and leading the Lehigh Valley Phantoms to a 4-1 road victory on Saturday night. Preserving a 3-1 lead into the third period, “Moose” saved his best for last while the Phantoms were out shot 17-0 almost through the entire third period. Greg Carey (25th, 26th) scored a pair of goals for the Phantoms to move into second in the league. Danick Martel (21st) tallied also and Cole Bardreau (7th) caromed in an empty-netter at the very end to seal victory. Misha Vorobyev set up half of the scoring with a pair of assists giving the talented Russian rookie six points in the last five games (2-4-6). The Phantoms were out shot 40-18 in the game but it didn’t matter because the 29-year-old Boston College product, John Muse, was there to lead the Phantoms to their fifth win in the last six games in a rematch game to conclude the home-and-home series. 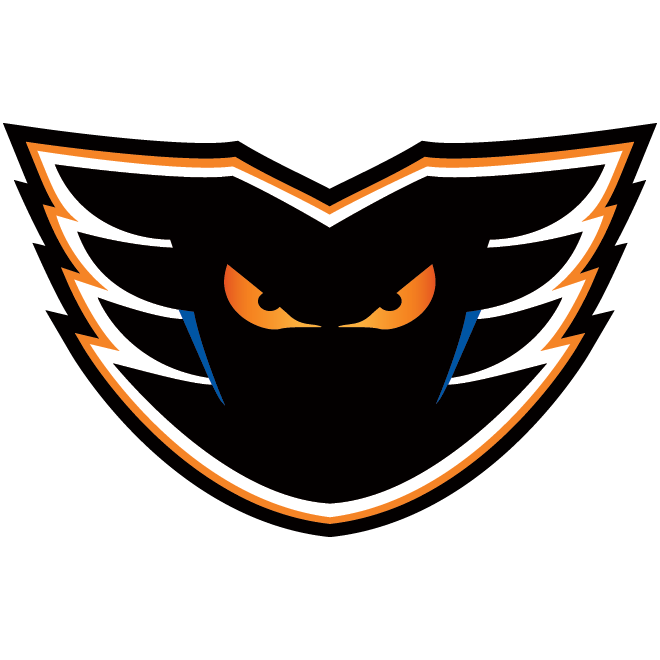 Muse improved to 9-1-0 with the Phantoms. 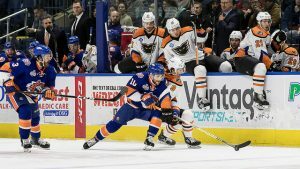 Lehigh Valley avenged the previous night’s setback sustained on their home ice to knock of the Sound Tigers back in their home environs. The Phantoms are 6-1-0 against Bridgeport this season and finished a perfect 4-0-0 at Webster Bank Arena. 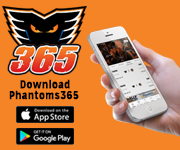 The first-place Phantoms improved to 39-16-7 for a league-leading 85 points while maintaining their nine-point advantage over the second-place Wilkes-Barre/Scranton Penguins at the top of the Atlantic Division. Lehigh Valley also trimmed its Magic Number to clinch a player berth by four from 18 down to 14. The Phantoms have 15 games remaining in the regular season after wrapping up their 61st game of the season tonight in Connecticut. Lehigh Valley has points in 13 of its last 15 games boasting an impressive mark of 12-2-1. The Phantoms also have points in 18 of the last 21 games for a record of 16-3-2 dating back to January 20th. The Phantoms opened the scoring at 12:32 into the game with Misha Vorobyev chasing down a free puck in the left circle and then quickly connecting with Danick Martel on the doorstep for the chip home behind Sound Tigers netminder Kristers Gudlevskis. A secondary assist on the play was also credited to Alex Krushelnyski as the Phantoms took a 1-0 lead on their way to ultimately improving their record to 24-3-4 in games in which they score the first goal. Bridgeport was quick to respond with a drive from the right point by Kyle Burroughs going low off the left post and in past Muse for a 1-1 tie just 91 seconds later. The opening period was characterized by a breakneck pace with both teams racing up and down the ice offering one quality drive after another. 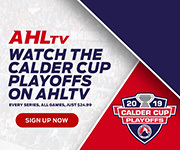 There were no whistles in the high-octane opening seven minutes and when the dust had finally cleared for the opening 20 minutes the two goalies had turned away 25 of 27 total shots with Bridgeport offering 15 drives on goal to Lehigh Valley’s 12. Things cooled off some in the second period…except for Greg Carey. Almost eight minutes into the middle frame, he rushed up the middle on the power play with Vorobyev on the right boards finding him quickly in the slot. Carey turned the puck to his forehand to throw a shot past the blocker of Gudlevskis for a 2-1 lead. Carey struck again almost 10 minutes later but this time with his hallmark powerful slapper. Off a Phil Varone faceoff win and a tap over from Will O’Neill, Carey was ready to unload from center-point with a laser that stayed low and eluded Gudlevskis for a 3-1 advantage. Carey almost recorded a natural hat trick just a minute later with a big blast that very nearly connected. Varone’s assist on the play and subsequent helper on the empty-netter later in the third period increased his point total to 61. The Toronto native continues to pace the circuit and is on track to become the first Phantom in 20 years to win the scoring title dating back to Peter White racking up 105 points in consecutive seasons for the Philadelphia Phantoms in 1996-97 and 1997-98. The third period was an exercise in trying to hang on. 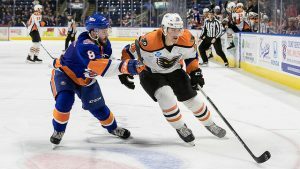 The hard-working Sound Tigers had the urgency and very nearly cut into the Phantoms two-goal advantage. On one sequence, Muse made consecutive spectacular stops from in tight to somehow deny the attack of the ferocious cats. 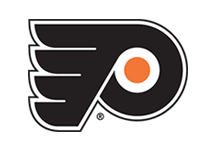 The performance was somewhat reminiscent of the night before when the Phantoms poured on 20 shots in the third period against Gudlevskis but were similarly denied the equalizing tally. With the clock almost down to 1:00 remaining in the game, the Phantoms were being out shot in the third period 17-0. But Tyrell Goulbourne intercepted a pass in the neutral zone and when Phil Varone’s attempt at the empty-net was blocked by Bridgeport defenders it eventually ricocheted off Bardreau and end for a game-sealing empty-netter that also would technically provide the Phantoms with their lone shot on goal of the very strange third period. 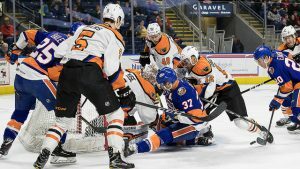 The highest scoring team in the AHL scored three or more goals in a game for the 40th time this season and improved to 36-1-3 when their offense produces to that extent. Lehigh Valley protected a second intermission lead to the finish and improved to 33-1-7 in games in which they lead after two periods. Lehigh Valley was 1-for-4 on the power play while limiting Bridgeport to 0-for-3. 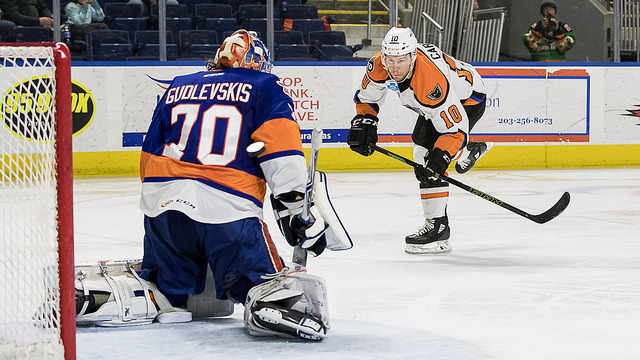 The Sound Tigers out shot the Phantoms 40-18. The Lehigh Valley Phantoms cap this week’s action on Sunday when the team returns home for a 5:05 p.m. clash with the Binghamton Devils inside PPL Center. Sunday’s game features a Pail & Shovel Giveaway free to the first 2,000 kids 14 and under presented by PALCS. A limited number of tickets remain for Sunday’s highly-anticipated showdown and are available HERE. Family 3-Packs are available for select games in March including three tickets, three hot dogs and three sodas with souvenir cups. 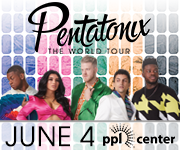 The package is available for $67.50 and fans can add extra tickets to their group for $22.50 each. The Family 3-Packs are valid for games on March 11th, March 18th and March 30th. 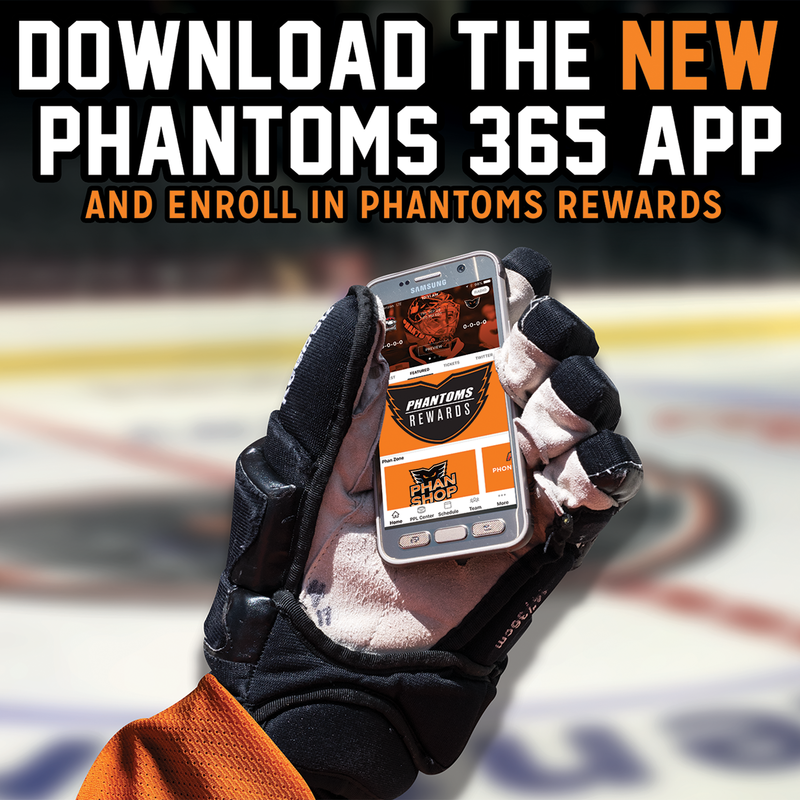 Secure your Family 3-Pack by calling the Lehigh Valley Phantoms at (610) 224-GOAL . 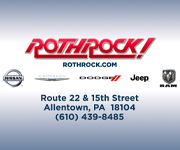 1st Period-1, Lehigh Valley, Martel 21 (Vorobyev, Krushelnyski), 12:32. 2, Bridgeport, Burroughs 6 (Wotherspoon, St. Denis), 14:03. 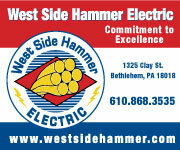 Penalties-Cullity Bri (interference), 8:49; Vecchione Lv (interference), 9:32. 2nd Period-3, Lehigh Valley, Carey 25 (Vorobyev, Brennan), 7:57 (PP). 4, Lehigh Valley, Carey 26 (O’Neill, Varone), 17:26. Penalties-Cullity Bri (holding the stick), 7:40; served by Martel Lv (bench minor – too many men), 8:51; Vecchione Lv (roughing), 11:53; C. Jones Bri (roughing), 11:53; Lafranchise Bri (tripping), 18:29. 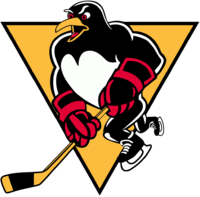 3rd Period-5, Lehigh Valley, Bardreau 7 (Varone, Goulbourne), 18:56 (EN). Penalties-Varone Lv (tripping), 4:23; Wotherspoon Bri (tripping), 11:19. Shots on Goal-Lehigh Valley 12-5-1-18. Bridgeport 15-8-17-40. Power Play Opportunities-Lehigh Valley 1 / 4; Bridgeport 0 / 3. Goalies-Lehigh Valley, Muse 9-1-0 (40 shots-39 saves). Bridgeport, Gudlevskis 10-11-5 (17 shots-14 saves). Referees-Tim Mayer (19), Michael Mullen (7). Linesmen-Nick Briganti (58), Brian Pincus (25).